Turn your publication into an efficient marketing tool. Link your publication to your Google Analytics account to monitor its popularity. This tool will help you to build a more effective strategy for dealing with your clients and business partners. Demographics (such as the geographical distribution of your visitors/readers according to their countries and the languages they use). Audience behavior (such as the number of new visitors, the turnout of the existing visitors, the specific pages they visit the most, and so on). Referrals (from which web-sites, social networks, or search engines they access from). These, and many more options are available with this feature. To start using this feature, you should simply sign in on Google Analytics service. Copy your UA number and paste it on to Properties/Publication Settings. 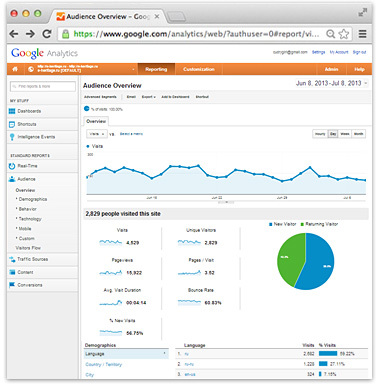 After the publishing, your statistics will be available on your Google Analytics page. For better audience insight, publications made with FlippingBook Publisher collect information about your readers’ search queries. With the help of Google Analytics you can trace what kind of information is mostly in demand in your digital magazines, catalogs and brochures. To discover what your readers search in your digital publications you have to log in to your Analytics account, then go to Standard Reporting > Content > Events > Overview > Event Label. The system will show you the most popular requests for any time period. You can range it by name, total number of requests, number of unique request etc. Understanding your audience is the key to a better marketing, and FlippingBook Publisher does its’ best to help you with your business.